Jumpster was a crazy little game that I came up with in 1983 while I was just getting a hold of mastering 6502 Assembly Language. 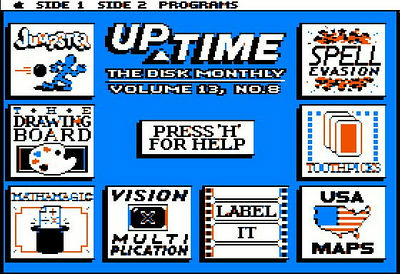 Eventually this game was published in UpTime Disk Monthly in 1987! 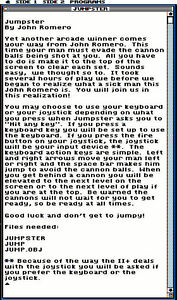 And here you see Jumpster in its menu system glory! The nice, short instructions.....which I did not write. Here's my shabby title screen slammed together after UpTime told me they wanted to publish the game. I hacked this in along with some other changes to support UpTime's shell program. The idea for the game was partially inspired by Olaf Lubeck's 1982 masterpiece Cannonball Blitz. Without the fun! 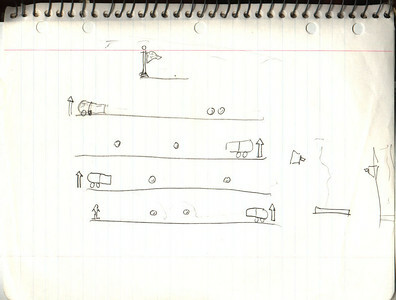 This was my initial sketch for what I thought the game could be, with the first level on the left and the 2nd level on the right. Another drawing of my idea for later levels in the game. 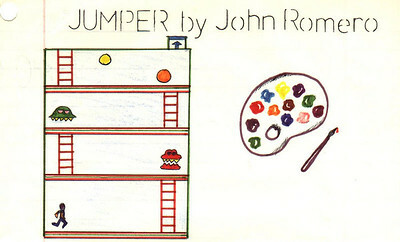 If the game was named Jumper instead of Jumpster. 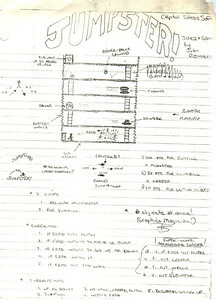 This was my design page for Jumpster and you'll see I was getting ambitious with adding new enemies. The problem was that I thought it was too similar to Jawbreaker II so I changed it to be simpler. It also looks like I was planning on using Graphics Magician for the animation back then. But I didn't - it's all my own code and none of Mark Pelczarski's! Evidently, this made Mark resort to teaching college many years later.